Learn more about Burma's turbulent history, from colonial rule to independence to increasing isolation under a military regime. Symbols of Burma's rich past decorate the "Royal City" near Pyinmana. Much of Burma's earliest history is unrecorded but by the ninth century the country was already ethnically diverse and roughly divided into two territories along the great Irrawaddy River. The Mons, who came from central Asia, dominated the lower basin, and the Burmans and Thais, who migrated mostly from China and Tibet and are the largest ethnic group, settled in the upper basin. For the next 1,000 years these and other migrants fought to protect and expand their Buddhist kingdoms. The country was unified for the first time under the Pagan Dynasty which is considered the Golden Age in Burma's rich history. The empire fell in the 13th century with the invasion of Kublai Khan's Mongol army. Only three times in the country's pre-colonial history would the entire nation be united under one rule. On an imperialist drive through Asia, British forces invade Burma in 1824. Following two more wars, the British take control of the whole country in 1885. The last Burmese monarch, King Thibaw Min, is captured in Mandalay and sent into exile in India. In 1886, Burma becomes a province of the British Raj. The new occupiers rule the country as two regional entities. Ministerial Burma becomes the heart of the country, both geographically and economically, where commerce and colonial governance is strong. The Frontier Areas (much of the country's border region) is mostly left to Burma's quarreling ethnic minorities. This two-tier system leaves ethnic groups such as the Karen, Shan and Kachin politically isolated and the country ethnically fragmented. Huge tracts of land are cleared for rice production, and the British begin to exploit Burma's vast oil and mineral resources. By the 1920s, a fledgling nationalist movement has taken hold. With the ideas of Nehru, Marx and others gaining currency, Burma's educated elite push for more say in how the country is run. Some of the first public protests are by students at Rangoon University. There is also increasing discontent in the countryside. In 1930, in the south, impoverished farmers ignite a massive peasant revolt. The rice crop has failed, and there is growing resentment that Indians, invited in by the British, are enjoying too much of the country's spoils. The British rulers brutally suppress the uprising, recruiting many of their soldiers from the marginalized ethnic Karen, who have aligned themselves -- for now -- with the colonial power. By the 1930s, two men have emerged to lead the country toward independence. Both are former student leaders at Rangoon University. U Nu will become Burma's first independent prime minister, and Aung San, father of Burma's pro-democracy leader Aung San Suu Kyi, a national hero in his country's struggle for freedom. Aung San proves to be a natural leader and is able to unite Burma's independence movement under the Freedom Bloc, a loose affiliation of parties driven by a common cause. In 1937, Burma was annexed from India and became an independent British colony. Under the British, Burma also became the largest rice exporter in the world. The war brings many changes to Asia, and new alliances are formed. 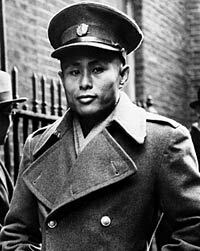 Looking for a sympathetic neighbor to help him oust the British, Aung San turns to communist China. But the expansionist Japanese find him first. In 1941, Aung San is invited with other Burmese activists, who become known as the "Thirty Comrades," to travel to Japan to receive military training and rouse support for their cause. In early 1942, the comrades return not only with new military skills but an invading Japanese army. 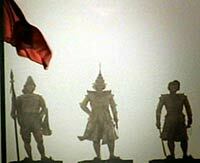 Together, they march on Rangoon. 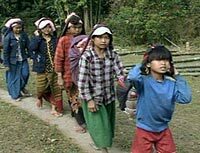 Calling themselves the Burma Independence Army (or BIA) and recruiting from thousands of disaffected Burmese, they force the British and Indians out of the city. This marks the beginning of the end of British rule. The Burmese nationalists strike a power-sharing deal with the Japanese; Aung San is made war minister, and the BIA is renamed the Burma National Army. Although Japan has promised Burma a path to full independence, by 1943, the war has turned against them, and Burma comes under Japanese sovereignty. Suddenly, the Burmese are back where they started -- under occupational rule. Throughout the war, the political fate of Burma plays like a game of ping pong. More political parties are formed, and the aim now is to drive out the Japanese. Aung San turns to his old nemesis, the British, for help. In a "marriage" of convenience but little else, the two forces stage a successful countrywide campaign against the Japanese in March 1945. It is an important victory for Aung San, who gets to keep his paramilitary army and further boost his political ambitions. By forming the Anti-Fascist People's Freedom League (AFPFL), he now has a party large and powerful enough to form the first provisional government, which then holds elections. During a historic visit to London in 1947, Aung San and British Prime Minister Clement Atlee agree on a timetable leading to independence. After 100 years of occupation, self-determination is within grasp. But, once again, events conspire against them. In July 1947, Aung San and six of his aides are gunned down at a cabinet meeting. Aung San's assassination at the age of 32 throws the country into despair. Independence goes ahead as planned on January 4, 1948, but Burma has lost a trusted leader and some of its most experienced politicians, who could have guided it through this perilous time. U Nu, Aung San's student ally at Rangoon University, is sworn in as Burma's first prime minister. For the Burmese, the first few years of independence are anything but a celebration of unity and freedom. The country is mired in power struggles and mistrust. With no one to fill the vacuum left by Aung San, the country is soon on the brink of civil war. Those unhappy with the terms of independence (many of the ethnic minority groups, who want their own autonomous states and realize that they occupy land rich in resources) begin attacking government forces. By the late 1950s, there are anti-government insurgencies among Burma's 100 or more ethnic groups across the country. Ne Win, an ambitious military commander in the national army and one of the original 30 Comrades, will play a pivotal role in Burma's path toward military rule. Born Shu Maung, he took the name Ne Win, which means "brilliant as the sun," and in a decisive military campaign in 1958, brings the country back to order. Sensing the weakness of his own government, which is already beset by splits, prime minister U Nu invites Ne Win and his Burmese Socialist Programme Party (BSPP) to form a caretaker government. It is a temporary measure, intended to restore order. But even though the prime minister, a devout Buddhist and popular leader, is overwhelmingly re-elected in 1960, his political days are numbered. In 1962, Ne Win overthrows the government in a military coup. By arresting U Nu and forming his own "Revolutionary Council" from handpicked military officers, he abolishes the constitution and begins to rule Burma by decree. Introducing his erratic manifesto, "The Burmese Way to Socialism," which is a mix of religious mysticism and ideologies borrowed from Stalin and Marx, he launches the country on a dark path to isolation. The very fabric of Burmese society is altered. Foreigners are expelled; the press is silenced; borders are shut down; and all industry is put under state control. Favored army officials become the new ruling class, and forces are dispensed to crush any kind of rebellion. Ne Win's totalitarian rule marks a new and particularly brutal period for the Burmese people, many of whom are suffering from food shortages, economic hardships and violent suppression. Burma's once prosperous economy has spiraled down, and approximately half the country's revenues go to support the military machine. In 1981, after nearly 20 years in power, Ne Win steps down as president but continues to be chairman of the ruling party. Realizing that the country has reached its nadir and is now one of the poorest nations in the world, Ne Win begins to experiment with free trade. But in 1987, in a maneuver that many believe was aimed at hurting the increasingly unruly masses, he devalues the nation's currency -- declaring roughly three-quarters of the money in circulation worthless. People's savings are wiped out overnight and there is rioting across the country. By August 1988, the Burmese people have had enough. Hundreds of thousands take to the streets, demanding the end to Ne Win's disastrous economic policies and brutal regime. Government troops respond swiftly, opening fire on demonstrators and killing thousands. The bloody conflict becomes known as the "8888 Uprising." With the country close to chaos, Ne Win resigns as chairman of the BSPP. But, instead of loosening its military hold, the ruling council uses the unrest to impose martial law and to form the ultra-repressive State Law and Order Restoration Council (SLORC). Some estimates put the death toll during the uprising at 10,000, with thousands more thrown into jail. In 1989, SLORC changes the country's name to Myanmar and the name of the capital from Rangoon to Yangon. Aung San Suu Kyi [see profile], the daughter of independence hero Gen. Aung San returns to Burma to support the Burmese struggle. She is soon placed under house arrest, ending a dismal decade for the Burmese. Aung San Su Kyi continues to denounce oppression and human rights violations and encourages peaceful protest across the country. Responding to international pressure and tightening economic sanctions, the ruling junta calls a general election in 1990. A landslide victory by Aung San Suu Kyi's National League for Democracy (NLD) catches the out-of-touch junta by surprise. Suu Kyi's party wins 392 out of the 485 seats. But the military government refuses to recognize the election and begins arresting opposition leaders, including Suu Kyi. Other opposition figures flee into exile and try to build political support abroad. In 1991, Suu Kyi receives the Nobel Peace Prize; however, the government of Burma refuses to free her to accept the award. Gen. Than Shwe in the new Royal City near Pyinmana. With its international reputation in shreds, the junta reshuffles its leadership, and Gen. Than Shwe becomes SLORC's new chairman, prime minister and defense minister. (Than Shwe rules Burma to the present day.) Considered a more "conciliatory" leader with a defter touch, he orders the release of several political prisoners. But many see this as nothing more than a PR exercise to help boost Burma's image abroad. In 1995, after six years under house arrest, Suu Kyi is released. Over the next few years, the ruling council will play a game of cat-and-mouse -- in turn arresting and releasing her or key members of her opposition. In 2000, while back under house arrest, she begins talks with the council to try to establish common ground. With the new millennium comes some progress as more political prisoners are released, including Suu Kyi in 2003. But by 2005, there's still no clear roadmap to national reconciliation. In the same year the junta moves the seat of government 200 miles from Rangoon to a lavish government-built compound called Piyinmana. Burma's National Convention, which was set up by the military in 1993 to draft a new constitution, meets again in 2005 to discuss the country's future. But neither Burma's ethnic minorities nor its democratic opposition is invited. Suu Kyi is again under armed guard at her compound in Rangoon, where she remains to this day. More than 500,00 Burmese refugees have fled their villages to refugee camps along the country's border. Since 1991, the United Nations General Assembly has issued 15 resolutions against Burma, and the former U.N. Commission on Human Rights has issued 13. All these resolutions call for Burma's military regime to stop systematic human rights violations, to release all political prisoners, to honor the 1990 General Election results, and to negotiate with the democratic opposition over reconciliation for the country. Trade sanctions continue and Burma's growing humanitarian crisis puts the country on the U.N. Security Council's agenda. But international response has had little affect. In May this year, Suu Kyi's house arrest is extended for another year. And earlier this month, constitutional talks resumed at the National Convention -- the 10th meeting of the convention in 13 years. In what most observers consider a sham spectacle, foreign journalists who are allowed to attend are told that "destructive elements" are hampering the talks. Meanwhile, more than half a million Burmese refugees live in camps on the country's borders. SOURCES: Office of the United Nations High Commissioner for Human Rights; the United Nations Security Council; Geographica.com; Burmaissues,org; U.S. Department of State; The Burma Debate (Open Society Institute of Soros); Channel 4 Dispatches (UK); Minority Rights Group International; Human Rights Watch; BBC news online: BBC Burmese; A Brief History of Burma by Thomas Lansner; Online Myanmar/Burma Library; University of Washington Library.